Python first became popular as a scripting language, which is used to automate repetitive tasks on a computer. As a scripting language, it is heavily geared toward being used in text-based command shell. In order to learn how to get the most of out Python, you need to learn how to use your command shell. Command shells are very operating system dependent. They are called different things depending on whether you are using Windows, Macintosh, or Linux. The commands that you are allowed to type in them also depend on your choice of OS. Below we describe how to use the command shell in each of the popular computer operative systems. The specific commands on the various operating systems are similar, but they can also be very, very different (particularly between Windows and OS X/Linux). If you have never used a command shell before, we highly recommand that you pick one operating system and use it for the entire semester; otherwise, this can get very confusing. In particular, if you have a Macintosh laptop, we suggest that you bring it to the lab sections, as the lab computers are all Windows machines. As with the Python installation instructions, this tutorial has a very much "do this, do that" flavor to it. This is to give you a quick introduction to the command shell. But we are not expecting you to master the command shell immediately. You will get a lot of practice with it over the course of the semester. In Windows, the command shell is called the Command Prompt. It can be found in the Accessories folder of your Start Menu, as shown to the right. When you start up the Command Prompt, you get a Window that looks something like the following. At any given time, the bottom line of the Command Prompt is the working directory followed by a > symbol. This > symbol is the prompt that gives the Command Prompt its name. It is a cue for you to type something into the shell. To get the Command Prompt to do something, simply type in a command, and hit Return. The shell will then process the command, either doing something or printing out an error message. When done, it will present the prompt again, ready for you to type in a new command. The Command Prompt has a property very similar to the interactive shell in that you can use the up and down arrows to revisit commands that you typed in previously. The most important thing to understand about the Command Prompt is that it works like the Windows Explorer. At any given time it is open to a specific folder (or directory) on your computer. We call the folder that is currently open in the shell the working directory. 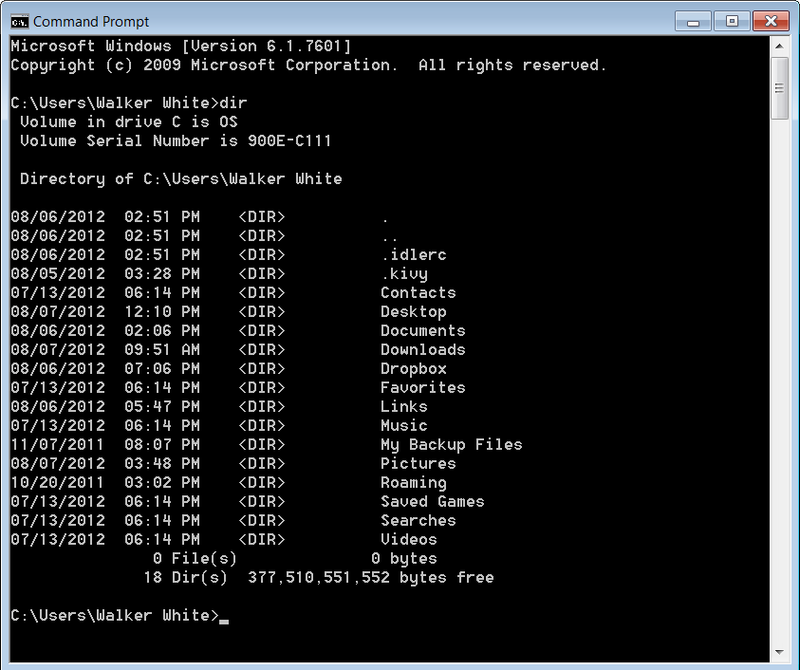 Whenever you start up the command prompt, the working directory will be your "home directory". This is the folder with the same name as your user account, (not the Desktop folder, but the folder that contains the Desktop folder). When working on a Python assignment, you want to make sure that the working directory is the directory that contains the .py files you are currently editing. Many a student has found themselves editing a .py folder while testing one (of the same name) in a different folder. You might be tempted to just put everything in your home directory. However, this is a bad idea and as the folder will get very cluttered as the semester progresses. Because you often need to change your working directory, the two most important commands to know in Windows are dir and cd. Typing in dir displays the current working directory as well as all of its contents. An example of the dir command is shown below. Try this out and then type dir; see the difference? There are a couple of important tricks to know about the cd command. The simplest form cd can only move to a folder that is "sees" (e.g. is a folder inside the working directory). If you change to directory (such as Desktop), you can no longer see the original directory (your home directory); it is outside of the current working directory. So how do you back-out if you go into a folder by mistake? and see what happens. If you typed it just after moving into the Desktop folder (from the previous example), then you should be back in your home directory. Combining cd .. with regular uses of the cd command are enough to allow you to move up and down the directory hierarchy on your computer. If you are new to the Command Prompt, you might find yourself quickly getting tired of all the typing that you have to do. Particularly when you have a directory with a very long name. A slight misspelling and you have to start all over again. Now hit the tab key. See what happens? Windows turns "D" into the first folder that it can find that starts with that letter (which is likely to be Desktop, and not Documents, as it comes first alphabetically). We refer to these expressions as paths; they are are a "path" from the working directory to the directory that you want to go to. The paths that we have shown you are more properly called relative paths. They show how to get from the working directory to your new directory. The correct path to use depends on exactly which directory is the current working directory. You will get an error saying that Windows cannot find that path. To solve the problem, put the directory in quotes. The following should work correctly. 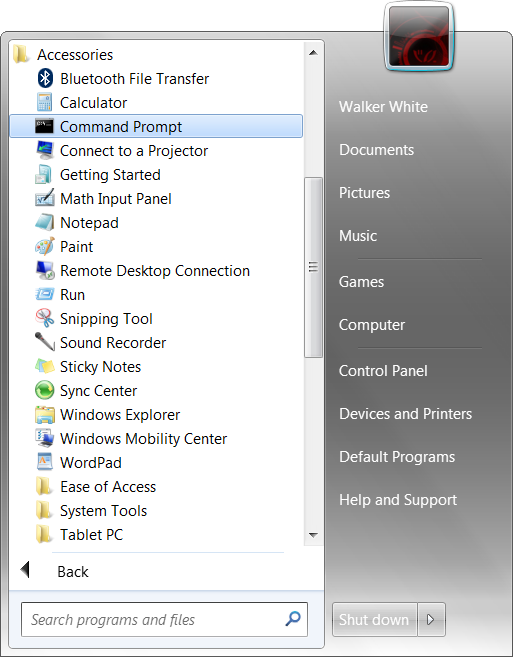 The Command Prompt allows you to do everything that Windows Explorer can do (and more). Some of the things that you might find the Command Prompt for is making folders, moving files, and deleting files. However, it is important to understand that none of this is necessary. For this class, you never need to understand how to do anything other than navigate directories. You can do everything else in Windows Explorer (or some other program) if you wish. The new folder will appear in the current working directory. The command prompt will only delete empty directories. If there is anything in a directory, it will not let you delete it. You have to delete the contents first. You move files with the move command. The way this command works is that you give it two file names. It searches for a file with the first file name; once it finds it, it makes a copy with the new file name and then deletes the original. (this by the way, illustrates why paths cannot have spaces in them). In this case, the Command Prompt will move assignment3.py into Desktop, but keep the name of the file unchanged. Be very careful with this command. It completely erases the file. It does not move the file your Recycle Bin. You cannot retrieve a file deleted this way. There are hundreds of resources out there on how to learn to use the Command Prompt in Windows. If you want to learn more, we suggest this tutorial as a starting point. If have are having difficulty with the Command Prompt, please see one of the course staff or consultants. They are available to help. On the Macintosh, the command shell is called the Terminal. If it is not in your Dock (where it belongs! 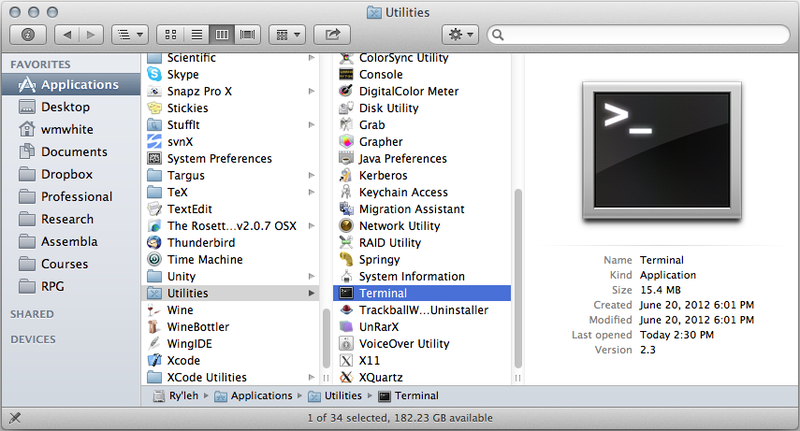 ), it can be found in the Applications > Utilities folder as shown below. When you start up the Terminal, you will get some message about the "last login" (a hold over of the days in which Terminals were used to connect machines over the network) followed by a line with a cursor that looks like a box. The left side of the line will depend on your settings, but if you ran the bashrc installer from the Python instructions, the last symbol should be >. This > symbol is called the prompt, and it is a cue for you to type something into the shell. The image below gives more details about the nature of the prompt. To get the Terminal to do something, simply type in a command, and hit Return. The shell will then process the command, either doing something or printing out an error message. When done, it will present the prompt again, ready for you to type in a new command. The Terminal has a property very similar to the interactive shell in that you can use the up and down arrows to revisit commands that you typed in previously. If you used the bashrc installer, you will notice a number in a box, just to the left of the prompt. This number tells you the number of the current command, and indicates how far you can go back with the up-arrow to old Terminal commands. The most important thing to understand about the Command Prompt is that it works like the Windows Explorer. At any given time it is open to a specific folder (or directory) on your computer. We call the folder that is currently open in the shell the working directory. Whenever you start up the command prompt, the working directory will be your "home directory". This is the folder with the same name as your user account, (not the Desktop folder, but the folder that contains the Desktop folder). If you used the bash installer, the current folder is listed to the left of the box with numbers, after the name of your computer. The symbol ~ is a special symbol indicating your home directory. Because you often need to change your working directory, the two most important commands to know in the Terminal are pwd, ls, and cd. Typing in pwd displays the current working directory. The command ls lists the contents (files and folders) in the working directory. An example of these two commands is shown below. Try this out and then type ls; see the difference? The ~ is a shortcut for your home directory. Typing that at any time will put you back in your home folder. This is very helpful should you ever get lost while using the Terminal. If you are new to the Terminal, you might find yourself quickly getting tired of all the typing that you have to do. Particularly when you have a directory with a very long name. A slight misspelling and you have to start all over again. Now hit the tab key. See what happens? It completes the work "Desk" to "Desktop", because it is the only thing in your home folder that starts with "Desk" (if you actually do have something else in your folder that starts with "Desk", this example will not work). and look at the contents with ls. See the difference? You will (likely) get an error saying that the folder "Python" does not exist. If you use Tab Completion a lot, you will notice that this is the prefered way of handling spaces. The Terminal allows you to do everything that Finder can do (and more). Some of the things that you might find the Terminal for is making folders, moving files, and deleting files. However, it is important to understand that none of this is necessary. For this class, you never need to understand how to do anything other than navigate directories. You can do everything else in Finder (or some other program) if you wish. 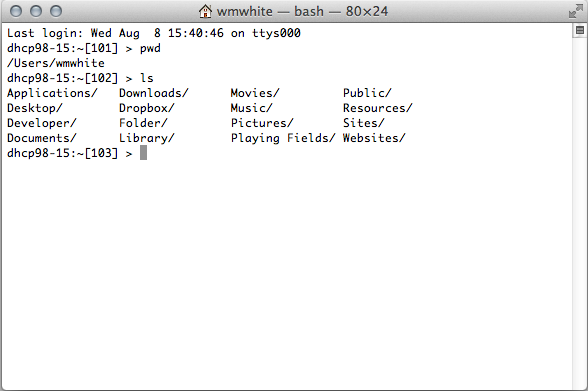 The Terminal will only delete empty directories. If there is anything in a directory, it will not let you delete it. You have to delete the contents first. You move files with the mv command. The way this command works is that you give it two file names. It searches for a file with the first file name; once it finds it, it makes a copy with the new file name and then deletes the original. In this case, the Terminal will move assignment3.py into Desktop, but keep the name of the file unchanged. Be very careful with this command. It completely erases the file. It does not move the file your Trash. You cannot retrieve a file deleted this way. If you have used our bashrc installer, then we have changed the settings of rm so that it will ask for confirmation before deleting. That way you will not delete anything by mistake. There are many resources out there on how to learn to use the Terminal in OS X. If you want to learn more, we suggest this tutorial as a starting point. If have are having difficulty with the Terminal, please see one of the course staff or consultants. They are available to help. Let's be honest here. If you use Linux, do you really need to learn how to use the command shell? How is it possible to do anything in Linux without knowing how to use the command shell? On the off chance that you honestly have never used a command shell in Linux, the hard part is finding the program that provides access to the shell. Which program to use depends on your choice of GUI. Once you have that running, simply refer to the instructions for OS X. While the programs are not exactly the same (particularly if you are running a shell other than Bash), they are close enough for purposes of this class. If you need more help with using the command shell in Linux, please see one of the course staff or consultants.